Cynthia Vandersluis' poems and essays have appeared in many regional publications and been selected by organizations such as the Arts & Humanities Councils and ARS POETICA, to be featured in galleries and public art displays. 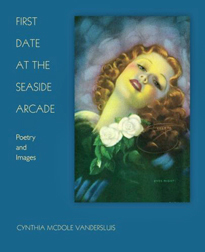 She is also the author of First Date at the Seaside Arcade (2016), a collection of poems and images. The illustrated anthology features 38 poems written over the past two decades, exploring love and loss, place and time, and how we move through the world. Over fifty images by a variety of contributing artists illuminate the poems, in media including watercolor, acrylic, collage, photography, mixed media, and linoleum block print.